Create Home Decor with Poster Frames | A Savings WOW! It’s about that time of the year where you are probably looking around your house and thinking, “what can I do to spruce up the décor around here?” One easy way to add a new twist is by hanging some posters around your home. Now we don’t mean hang up posters of your favorite bands using thumb tacks like you used to do in high school. There’s a better way to showcase your favorite posters and artwork – using poster frames. With the variety of wholesale poster frames available, you’ll be able to find one that matches your décor. What’s great about Wholesale Poster Frames is that you can either select a standard size frame or give them your poster’s dimensions and they will create a custom frame for you. They also offer a lens cover that gives the same look as glass and acrylic, but is easier to clean and has other advantages. It also helps protect against UV rays that can cause paper and fabric to become brittle, fade, or turn yellow. One way we plan to spruce up our home is to create a poster-sized collage of family photos and frame them. You can use photo services from Walgreens, York Photo, Shutterfly, and other photo finishing services to create your own posters of your favorite photographs and designs. If you do not want to create your own posters or artwork, you can find many options at a variety of stores, including Michaels, Joann, HomeGoods, and more. So, tell us, what would you frame and use as decor in your home? Thank you for reading A Savings WOW! 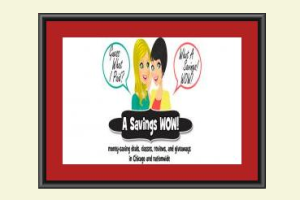 and don’t forget to check out our check out our Coupon Database for lots of money-saving coupons! Disclosure: This post may contain affiliate links. Please see our disclosure policy for more information. Let me be your Personal Shopper!